It may be a small sample size, but catcher Sandy Leon has been mashing for the Red Sox at the plate. Ed. Note- Now that summer is here, we're brining back our weekly look at how each of Boston's position players are contributing offensively. Each week, our resident stat guru Adam Lowenstein will break down who's trending up, who's spiraling down, and how it will affect the Red Sox. Losers of their previous two series, the Red Sox close out June with a three-game series against the struggling Tampa Bay Rays at Tropicana Field. However, just like Clay Buchholz, Eduardo Rodriguez continued to struggle in the first inning on Monday. 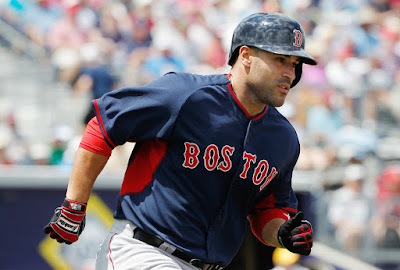 John Farrell tried to keep the newest Pawtucket Red Sox player in the game as long as possible, but E-Rod became the main reason for the Rays setting a new season high in hits. RF Mookie Betts continues to lead off games well, but his on-base percentage took a dip in Monday’s blowout at the hands of the Rays. His five-game hitting streak ended in the 13-6 loss, as he went 0-for-5, including two unsuccessful at-bats with runners in scoring position. However, he is not a person to worry about, as he readies to start his first All-Star Game. 2B Dustin Pedroia’s batting average remains above .300, but he did not score or drive in a run in any of the last three games. Pedroia went 0-for-2 with runners in scoring position on Monday. SS Xander Bogaerts is tired, and everyone is correct for questioning John Farrell’s decision to keep Bogaerts in for all of Monday’s 349-pitch game. Maybe he will finally get a day off soon. On the bright side, the X-man took advantage of his ninth-inning at-bat by hitting a single and scoring the final run of the game. DH David Ortiz keeps getting walk after walk after walk (well, only two walks on Monday) and, although he had only one double over the last week, he still has a chance to break the MLB record for most doubles in a season: 67 by Red Sox RF Earl Webb in 1931. Ortiz’s 10-game hitting streak ended on Saturday, but he remains a force. 1B Hanley Ramirez extended his hitting streak to six games on Monday, but left the bases loaded when he was called out on strikes to end the top of the fifth inning. Ramirez had three home runs in the first four games of his current hitting streak. CF Jackie Bradley Jr. walked once on Monday, but his four at-bats all ended in strikeout fashion. Before Bradley’s back-to-back 0-for-4 games, he had been seeing a lot of pitches and producing. However, he did have a couple 0-for-3 games against the White Sox. His batting average has dipped below .300 for the first time since May 8, so he may not be a huge force in the lineup, but still should make an impact in the lower half of the order. LF/DH Bryce Brentz launched his first MLB home run on Sunday. He then went 3-for-4, including two doubles, on Monday and became the only Red Sox player with multiple doubles over the last week. C Sandy Leon had his first round tripper of the season on Monday, as he continues to torch 2016 pitching in a small sample size. The 27-year-old Venezuelan already has his best single-season Wins Above Replacement in his career. 3B/2B Marco Hernandez has tallied a hit in five of his six starts in his MLB career. Although he was hitting ninth in the batting order on Monday, he had his first career three-hit game. BN/3B/1B Travis Shaw came into Monday’s game late and grabbed a run batted in on a sacrifice fly. His back-to-back 0-for-4 games coming into Monday are putting Farrell in a tough position in terms of how to put together the bottom of the batting order. BN/C Christian Vasquez pinch-hit for David Ortiz on Monday and singled, which made fans feel a little better about him at the plate. However, there was a reason he did not start again. His bat has been much worse than Leon’s, and although Leon has been on fire at the dish, Vasquez has left a lot to be desired. DL/LF Chris Young’s strained right hamstring that he suffered on the Fenway Park base path forced him to the disabled list. If Brock Holt can come back soon and fill in, then Young can heal to close to 100 percent and hopefully return his hot bat to the lineup.